Claw foot tables became a common fixture in many European and American homes during the 18th and 19th centuries. From massive banquet tables to quaint candlestick tables, these tables can be found in a wide variety of sizes and styles. Note that when you're looking, claw foot tables are more likely to be found under descriptions or categories that include phrases such as "Queen Anne," "Chippendale," "Victorian," or "American Empire." Stanley Weiss Collection- Here you will find a vast collection of American and English furniture from the 18th and 19th centuries and a great selection of tables including card tables, tilt top tables, drop leaf and console tables. The Chippendale styles of American furniture from 1750 to 1780 display a much more conservative style then the English Chippendale styles of the same period. Although the ball and claw foot is found on almost all of the American Chippendale style tables of the times, it is rarely found on English furniture pieces from the same years. By that time in England, the ball and claw foot was already out of fashion. Several distinct American Chippendale styles of furniture developed, each having a distinctive regional characteristic variation of the ball and claw foot. New York - Chippendale style furniture of New York had the distinctive placement of the eagle's talons clutching a squarish-shaped ball. The placement of the eagle's claws is close together. Rhode Island - The distinctive design of ball and claw foot of furniture made in Rhode Island includes slightly undercut eagle talons grasping an oval shaped ball. Massachusetts - Furniture made in Massachusetts has the distinctive style of crisply carved ball and claw feet with the talons forming a triangle when viewed from the side. This is achieved by the side talon being sharply turned back, forming the angle with the center claw. 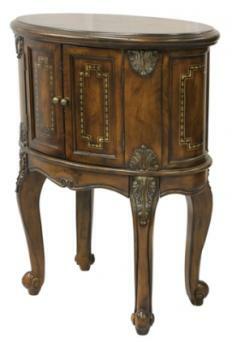 Philadelphia - Furniture made in the Philadelphia area has ball and claw feet with finely detailed talons. Another foot design that is sometimes found on American Chippendale style antique furniture is the hairy paw foot, which is designed to resemble an animal's paw complete with claws. A variation of the hairy paw foot, also called the furry paw foot, is often found on tables of the American Empire style. Ruby Lane- Ruby Lane has been in business since 1998. They maintain a high level of professionalism with quality, accurate product representations, and reputable sellers. 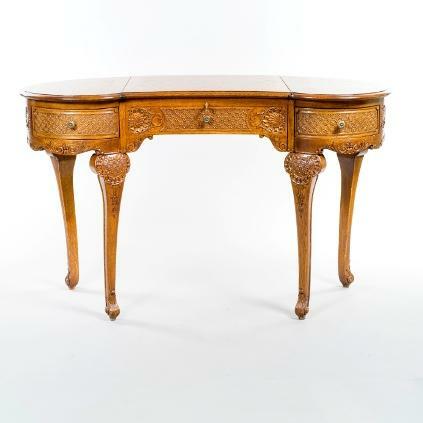 Browse through a large collection of antique American and European tables. Aardvark Antiques- Based in Georgia, this company sources their inventory of antique furniture from estate sales throughout the southeastern U.S., as well as taking furniture on consignment. You can see their inventory of antique tables at a local showroom or online. With the turn of the century, furniture designs reflected the return to neoclassical styles. American Empire style tables stood on flared legs often terminating in the clawed feet of lions and eagles. The later part of the century saw a turn to beautiful massive dining tables and buffet tables of quarter sawn oak. Exquisite Grecian style columns or heavy pedestals often ended in three or four lion claw feet. Salado Creek Antiques- This family-owned antiques store located in Texas has been in business since 1992. They specialize in American Victorian, Empire and Renaissance Revival furniture. Here you can find claw foot dining tables, game tables and library tables. The Harp Gallery- This company was founded in 1985 and has a showroom in Appleton, Wisconsin. You can also view their inventory of antique furniture online, which includes a nice selection of antique tables. Each item has multiple pictures taken from a variety of angles that can be viewed in full screen, allowing you to see more detail. Imperfections in carvings- Hand carved ornamentation will be uneven and unsymmetrical, whereas machine carvings will be smooth and symmetrical. Old hardware and construction- If the furniture is held together by dowels or mortise and tenon joinery, it is likely to be an antique. Finish- Shellac, oil, wax and milk paint are all indicative of antique furniture. Wear and smell- Antique furniture will show signs of natural wear, with random scratches, stains or dents. The furniture should also have a musty odor. Modern materials- Staples, Phillips screws, lacquers, varnishes and fiberboard are all indicators of modern reproduction furniture. Symmetrical construction- Modern, machine cut furniture pieces will be perfectly symmetrical in size and shape. Smell- Reproduction furniture may still have a fresh cut wood smell. The best way to find good deals on antique furniture is to comparison shop prices. The Internet makes this easy and convenient, so visit several online dealers and make a list of prices for the type of antique table you are interested in buying. Don't be afraid to make an offer for a lower price as long as it is reasonable. 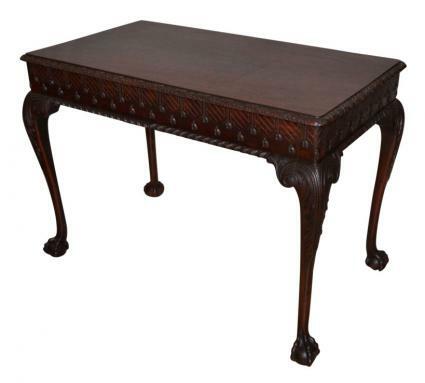 If the main reason you are buying a claw foot table is that you like the style, look for a reproduction. It can save you money, and it looks almost identical to an antique original.